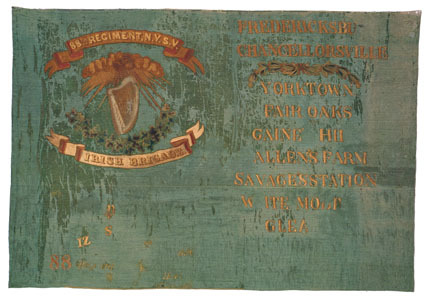 In the autumn of 1862, Tiffany & Co. of New York City produced national colors and green regimental colors, known as “Irish Colors,” for each New York regiment in the “Irish Brigade,” including this flag for the 88th New York Volunteers. Amazingly, on December 15, 1862, the New York regiments received the prized flags during a presentation ceremony shortly after the Battle of Fredericksburg, Virginia, while under intermittent enemy fire and still attending to their wounded. This green silk “Irish Color” presented to the 88th New York Volunteers originally featured the regiment’s battles from 1862, Irish iconography, and a presentation inscription. None of the three New York regiments in the brigade, including the 88th New York Volunteers, carried these presentation flags into battle. Instead, the beautiful banners returned to New York and served as a vital recruitment tool in the city’s Irish-born community. See the 88th Infantry Regiment History Page for more information about the unit.